Kristty has 20 years of experience coloring hair. From covering up greys, integrating highlights, or a completely different color change – Kristty can do it all! If you’re looking for the best hair dye professional in Clayton NC, then look no further, because Kristty can provide exactly what you want. She will work with you to make sure that the color is perfect for your complexion and that any grey hairs are covered. When you walk out of her salon, you will leave feeling beautiful and confident in your new hair! After Coloring, wait two days before you shampoo or longer if possible. This will allow the color plenty of time to set. Shampoo your color-treated hair less frequently. Also, condition every time you shampoo. Even if you have fine hair, always condition the tips, which are the oldest hairs on your head. These hairs certainly have the most damage. Use less heat on your color-treated hair. Dyed hair is more susceptible to damage. So try to avoid using blow dryers, curling irons or straightening irons. It is best to allow your color-treated hair to dry naturally. If you really need to blow dry your hair, keep it on the lowest heat setting. Don’t skip regular hair cuts. Dyed locks may become frizzy is your hair is damaged. The best way to keep your hair looking its healthiest is to get regular trims. Protect your hair from exposure to UV rays in order to make your hair color last. 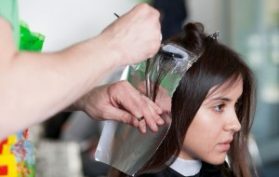 UV light damages hair, causing the dye molecules to fade or turn brassy. 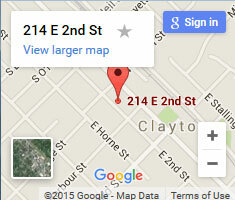 Hair Salon Clayton NC – find out why we’re the favorite destination in downtown Clayton! Need a perm? It’s no secret that the fall inspires moodier, enthusiastic, luscious, and vibrant shades of hair colors. Hair colorists have been giving their predictions about this year’s most popular fall hair colors. Cream Soda Hair The fall’s hottest and most popular hair color trend is none other than creamy blonde hair created with creamy beige color….